The ongoing discussions on diminishing water resources have somewhat pushed soil and land use issues to the background. However, today nearly 2 billion hectares of land are affected by human-induced degradation processes, putting the livelihoods of more than one billion people at risk (UN Millennium Development Declaration). Unsustainable resource and environmental policies, poorly defined land rights, pressure from urbanisation, primarily production-oriented land use and agricultural intensification, often coupled with a rising demand for land, accelerate the loss of fertile soils. Land degradation causes considerable changes in the productive and regulative cycles of ecosystems. While poverty can aggravate land degradation, it is also a consequence of diminishing land resources. • Interconnections between sustainable land use and multinational agreements within and outside UN organisations on water, biodiversity, and other issues need to be given more consideration. • The UNEP strategy supports the development of environmental policies that integrate innovative land use strategies. This often requires transparent and participatory institutional restructuring, for example by merging various areas of responsibility or redefining task fields. Instruments and guidelines are needed in order to achieve this and a transparent information policy is promoted, combined with awareness raising on all levels. • The UNEP acknowledges the identification and economic valuation of services provided by soil ecosystems to be a pivotal aspect in innovative economic policies. civil society into the dialogue and foster its competences. Local knowledge and experience are important elements in adapting and prioritising innovative land use strategies on the local, national and regional levels. Another comprehensive study from Uganda illustrates the complexity of developing policies and strategies on poverty reduction and promoting sustainable land use on both the national and the local level. While population pressure and expansion of agricultural production accelerate soil erosion, several factors, such as a higher education, livestock farming, and non-agricultural income, can help reduce the loss of soil nutrients. In this respect, the different situations and potentials of women and men are an important aspect – something that is not sufficiently considered in the UNEP strategy. The Uganda study emphasises that ”win-win-win” solutions combining an increase in agricultural production and income with a reduction of land degradation hardly exist. The responsibility for an integrated approach is assigned to the NGOs, while the importance of national policies taking a guiding role is left unmentioned. 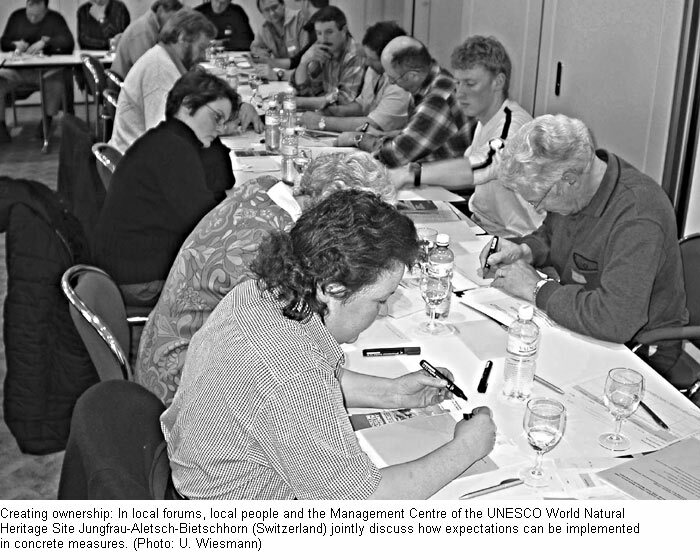 > UNEP’s Strategy on Land Use Management and Soil Conservation, A Strengthened Functional Approach. UNEP Policy Series 4, 2004. 63p. > Strategies for Sustainable Land Management and Poverty Reduction in Uganda. Ephraim Nkonya et al. IFPRI, Research Report 133. 2004. Around 70% of all water resources in human use flow into agriculture. The production of 1 kg of cereals, for example, requires between 500 and 3000 litres of water. Current production patterns are often unsustainable and inflict lasting damage on aquatic ecosystems. The demand for water may continue to grow: efforts to increase global food security, and, thus, agricultural production, as well as a trend towards more water-consuming foods such as meat, make this seem quite probable. The quoted report locates a need for action on different levels in order to secure sustainable global water use: water productivity must be increased and the necessary technology made available; consumption patterns need to be influenced towards a healthy diet and moderate water consumption; aquatic ecosystems need adequate protection; agricultural subsidies and trade barriers that impede trade in water-saving foods must be abolished. An interesting aspect of the report is the important role it attributes to consumption trends in the global water issue. At the same time, it points out that food production is more and more demand-oriented. However, the question of how consumption patterns might be redirected onto a more sustainable track is left unanswered. Management Institute (IWMI), New York, April 2004. 36 p.
The FAO estimates that over the past century around 75% of the genetic diversity of agricultural crops has been lost. Today, the world population’s food supply is based on few productive varieties of a limited number of crop plants. This narrow genetic range makes global agriculture prone to epidemics and negative effects of climate change. This year’s World Food Day on 16 October will therefore be dedicated to biological diversity as an insurance against future famines. This thematic focus will also provide the FAO with an opportunity to showcase ”its” International Treaty on Plant Genetic Resources, which came into force on 29 June. This treaty acknowledges the great contribution farmers make to sustaining genetic diversity, and thus strengthens farmers’ rights. Part of the agreement regulates a multilateral system that secures access to genetic resources for researchers and breeders, while a share of the production profit is also allocated to the guardians of biodiversity, i.e. to farmers in the South. The intentions embodied in the treaty are welcomed by all parties concerned. However, the interpretation of the treaty text by farmer organisations and agro-industry representatives differs substantially with regard to intellectual property rights. The treaty’s implementation will no doubt lead to controversial discussions. In 1999 the UN Decade on Natural Disaster Reduction came to a disappointing close: natural hazards were causing more human suffering and higher economic losses than ten years earlier. Analysts speak of further increasing ”risk burdens” due to myriads of wrong development decisions through all levels from the local to the international. In the light of this disillusioning assessment, the UN is calling a World Conference on Disaster Reduction in 2005 in Kobe, Japan. Furthermore, the UN-Secretariat of the International Strategy for Disaster Reduction (ISDR) has completely revised its successful report entitled Living with Risk: A global review of disaster reduction initiatives, which was first published in 2002. The new edition, published in 2004, no longer aims solely at sensitising people with regard to possible catastrophic effects of natural hazards; it places more emphasis on the fact that a majority of natural hazards are caused by human activities. The report supports politicians, implementation-oriented institutions, and other interested individuals in preventing natural hazards or mitigating their negative impacts. This is done with a view to more careful planning and improved regulation mechanisms. The strength of this report lies in its practice- oriented content, its wealth of details, and its nonetheless clear structure. Online extracts of the report already provide a good insight into the issue. This publication, edited by the International Development Research Centre (IDRC), International Cooperation Centre on Agronomical Research for Development (CIRAD) and the Senegalese Agricultural Research Institute (ISRA), capitalises on their experiences of urban agriculture in Africa. It presents diagnostic and intervention approaches to deal with the processes at work in urban agriculture, its place in urban planning, vegetable and animal production chains, and its contribution to the recycling of urban waste. In Africa, vegetable growing tends to be the most common form of urban agriculture – an activity that is best suited to provide food, employment and income. Chapter 3 contains a thorough production chain analysis which explains the link between the demand for vegetable products and existing marketing channels. The contextual study of production and its restrictions (access to land and input) and the motivations behind it (self-sufficiency in food, quick returns) also considers the social role of vegetable growing and sets out the different types of farming involved. Finally, access to seeds and water, the use of genetic resources, and an advice service are put forward as ways to improve vegetable production in Africa. Source: Développement durable de l’agriculture urbaine en Afrique francophone : enjeux, concepts et méthodes. Ed. Olanrewaju B.
Smith… [et al.]. 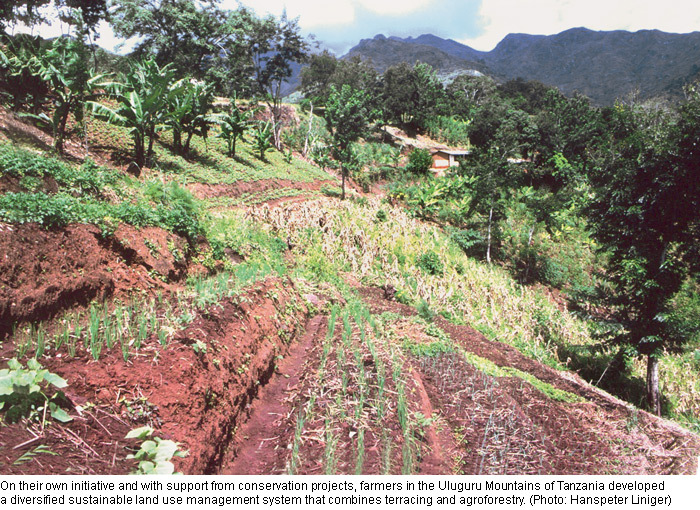 CIRAD/IDRC, 2004. 176 p.
The Guidelines can serve those interested as a valuable checklist. However, the list provides little help when it comes to establishing concrete planning and implementation processes. Source: Guidelines for Planning and Managing Mountain Protected Areas. For many years, thirty-five thousand Bolivian farmers relied on illegal coca cultivation to secure their livelihood. 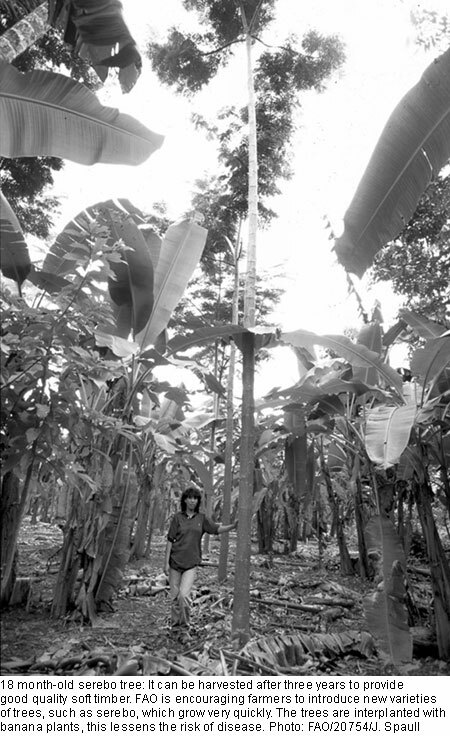 The construction of a sawmill in the midst of Bolivia’s tropical lowlands in 1997 marked the launching of an FAO project designed to reduce dependency on coca cultivation by partly replacing it with sustainable use of forests for timber production. Earlier, coca farmers cultivated rice for their own subsistence, slashing and burning the forest to clear the required space. The project manager pointed out to them that in order to clear the space required to grow a rice crop worth USD 300, they were destroying USD 3000 worth of timber. This convinced the farmers to begin using the forest for timber production in a sustainable manner. However, the shift from coca growing to timber trade reduced their salaries from USD 2000 to USD 900 per year. Additional cultivation of various crops, such as rubber, coffee, cocoa, camu camu, and achiote are now hoped to help improve the income. Similarly to these activities in Bolivia, the FAO is trying to support poppy farmers in Afghanistan in their shift from drug cultivation to growing alternative crops. Improved education, infrastructure and access to credits will help foster fruit and vegetable cultivation, the growing of niche cultures, such as spices or mulberries for silk, as well as essential oil production and chicken farms. > Alternatives for the Transformation of Drug Production Areas in Bolivia – Results from the Region Chapare for Farming Systems (Abstract). Juan Carlos Torrico, et al. Deutscher Tropentag. Göttingen, October 2003. 1p. How can farmers’ needs and concerns be integrated into development policy decisions? The quoted report contains an analysis of three large African farmers’ institutions and their background. These institutions differ clearly in their orientations: Two of them are closely linked to the government and support programmes in favour of a market-oriented economy, while the third is independent from the government and, as an independent advocacy organisation, demands efforts to improve rural livelihoods. Furthermore, one organisation focuses more on counselling, while the others emphasise their role as a representative of members’ interests. Nevertheless, the report gives several recommendations that are applicable to all institutions: to improve the staff’s educational level, as well as information exchange within the given organisation; to strengthen the farmers’ attachment to their organisation through annual fees and the right to elect representatives; to define the leaders’ responsibilities towards the grass-roots members more clearly; and to improve the coordination and communication between the two. Furthermore, the authors recommend that financial dependency on foreign development organisations be reduced and openness for the farmers’ interests among government workers be promoted. The distinguishing feature of ”Gender relations in forest societies in Asia” is that it combines the history of and myths surrounding forest communities with an examination of the current situation of this population group. Using country case studies (China, India, Malaysia and Thailand), this publication explores the advances and regressions in the role of women in these societies, their struggles and external influences at work. For example, since 1980, the issue of the right of access to the forest at the local level in Uttarakhand (India, Himalayas) has been driven by the global ideology of environmental conservation. Consequently, the regional forestry department of Uttar Pradesh, through a World Bank project, promotes village forest joint management (VFJM), taking its inspiration from a model based on the traditional idea that control of and access to forest resources belong to the men. However, alongside this process, a mixed form of informal village forest joint management has also developed. It is supported by women’s groups who have demanded and received recognition within their own family or community. This work is of interest to anyone who is active in village forest joint management. This type of management is crucial in combating poverty insofar as it implies the involvement of women in the process at the social, economic and political levels. The most disadvantaged populations often depend on income from non-cultivated natural resources for their survival. Basing their research on many small-scale experiences, the authors develop this point insofar as they attempt to capture the importance of this income, define it as well as quantify it in the relevant context. The findings of the analysis are presented in Chapter 4 by means of hypothesis testing and several tables accompanied by extensive commentaries (comparison of income by economic sector and by source, consideration of external domestic factors, diversification of income sources, geographical area and the type of forest). The authors conclude that the income generated by forest resources represents an average contribution to household income of 22% in the populations sampled, with the main sources being firewood, wild foods and animal fodder. These findings will be useful for programmes to combat poverty and to conserve natural resources. However, it should be noted that due to the wealth of variables given and the economic analysis per se, this study might be somewhat inaccessible to the non-economist. World Bank, 2004. XV, 95 p.
The information needs expressed by users of InfoResources News and Focus are strongly centred around transdisciplinary topics, such as sustainable land management. Above all, users are interested in how these topics can be implemented in strategies and projects. This is the result of a user survey commissioned by InfoResources. The users were asked about their information needs and their assessment of various information products. We thank all those who participated and thus help us to improve. • The frequency of publication was assessed ’just right’ by 75% of the users for InfoResources News and for 66% of the users for InfoResources Focus. • The layout and structure of both the Newsletter and Focus also finds a very high level of agreement. • A surprising and highly positive outcome of the survey is the high degree of intense readers: 27% of them read the entire publications, and another 42% read individual articles entirely. • Another pleasing result is the high percentage of users who make active use of the information they obtained from InfoResources publications. Half of the users click on links, download documents, or use ideas in conferences. Based on these results, we will keep our products in their current form. However, the contents will be more strongly oriented towards the needs expressed by our users.